Back in the days of Burning Crusade, leveling up your character was a very tedious procedure. 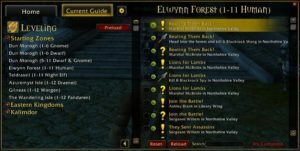 The quests were not even shown on the map, you always had to read through the quest list and figure out where to go and what to do (which mobs to kill, items to retrieve, etc.). After a few more expansions, questing became a little bit easier, due to the quest chains being more linear. You can pretty much follow the main quest storyline. Also, the map became more interactive.